Download "Overview: Inviting and Paying Foreign Visitors"
1 Overview: Inviting and Paying Foreign Visitors This article is intended to be a brief reference for departments that are planning to pay foreign visitors who are considered nonresident aliens for services performed in the U.S. as independent contractors or for travel reimbursement. Generally, visitors who are coming to speak at a short course or meeting will be paid honoraria as independent contractors, not compensated as employees. 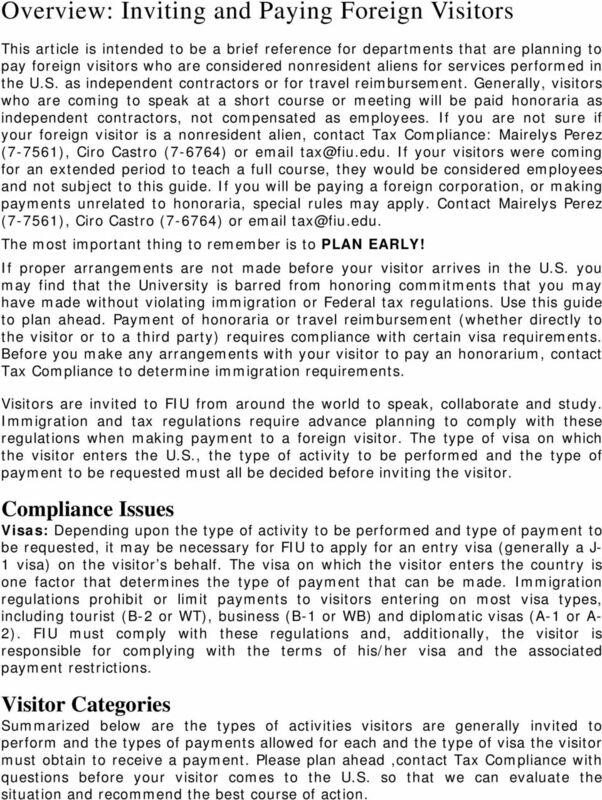 If you are not sure if your foreign visitor is a nonresident alien, contact Tax Compliance: Mairelys Perez (7-7561), Ciro Castro (7-6764) or If your visitors were coming for an extended period to teach a full course, they would be considered employees and not subject to this guide. If you will be paying a foreign corporation, or making payments unrelated to honoraria, special rules may apply. Contact Mairelys Perez (7-7561), Ciro Castro (7-6764) or The most important thing to remember is to PLAN EARLY! If proper arrangements are not made before your visitor arrives in the U.S. you may find that the University is barred from honoring commitments that you may have made without violating immigration or Federal tax regulations. Use this guide to plan ahead. Payment of honoraria or travel reimbursement (whether directly to the visitor or to a third party) requires compliance with certain visa requirements. Before you make any arrangements with your visitor to pay an honorarium, contact Tax Compliance to determine immigration requirements. Visitors are invited to FIU from around the world to speak, collaborate and study. Immigration and tax regulations require advance planning to comply with these regulations when making payment to a foreign visitor. The type of visa on which the visitor enters the U.S., the type of activity to be performed and the type of payment to be requested must all be decided before inviting the visitor. 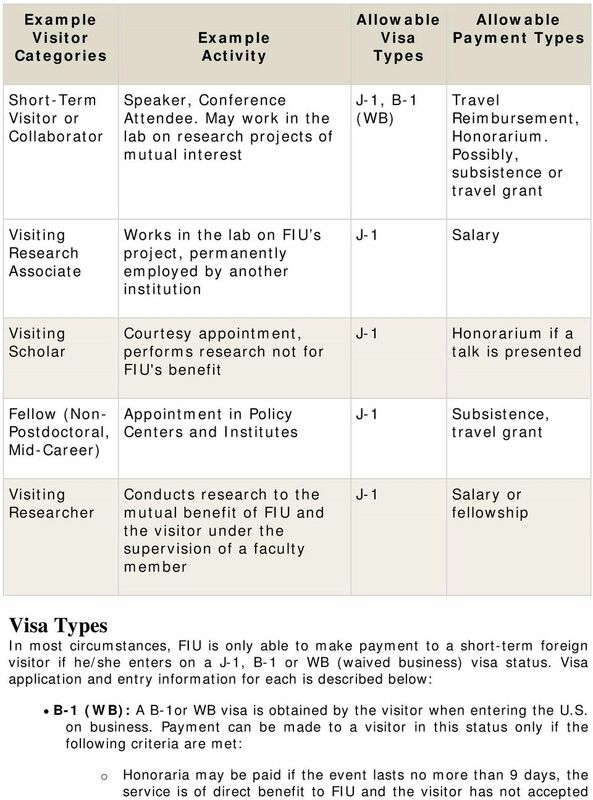 Compliance Issues Visas: Depending upon the type of activity to be performed and type of payment to be requested, it may be necessary for FIU to apply for an entry visa (generally a J- 1 visa) on the visitor s behalf. The visa on which the visitor enters the country is one factor that determines the type of payment that can be made. Immigration regulations prohibit or limit payments to visitors entering on most visa types, including tourist (B-2 or WT), business (B-1 or WB) and diplomatic visas (A-1 or A- 2). 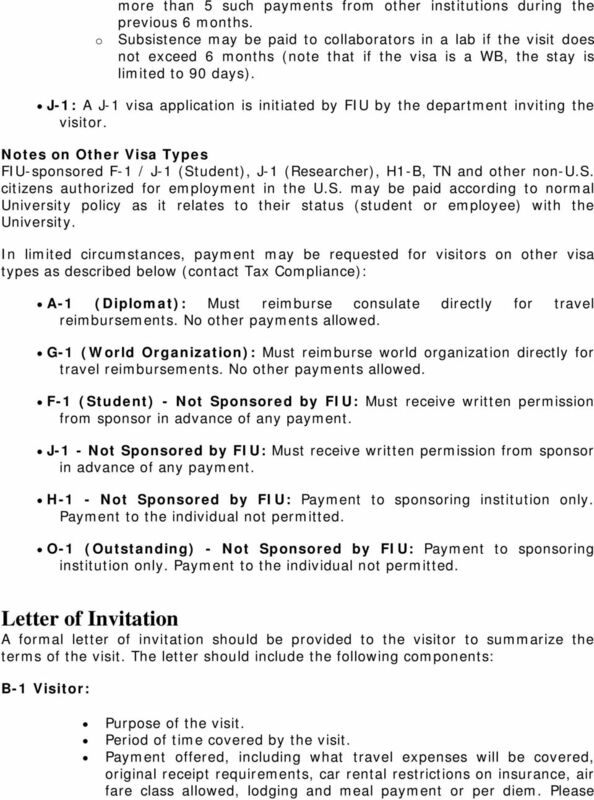 FIU must comply with these regulations and, additionally, the visitor is responsible for complying with the terms of his/her visa and the associated payment restrictions. Visitor Categories Summarized below are the types of activities visitors are generally invited to perform and the types of payments allowed for each and the type of visa the visitor must obtain to receive a payment. Please plan ahead,contact Tax Compliance with questions before your visitor comes to the U.S. so that we can evaluate the situation and recommend the best course of action. 5 or apply for a Social Security Number or ITIN. Foreign visitors from a country with a tax treaty may claim exemption from withholding by filing Form W-8BEN. 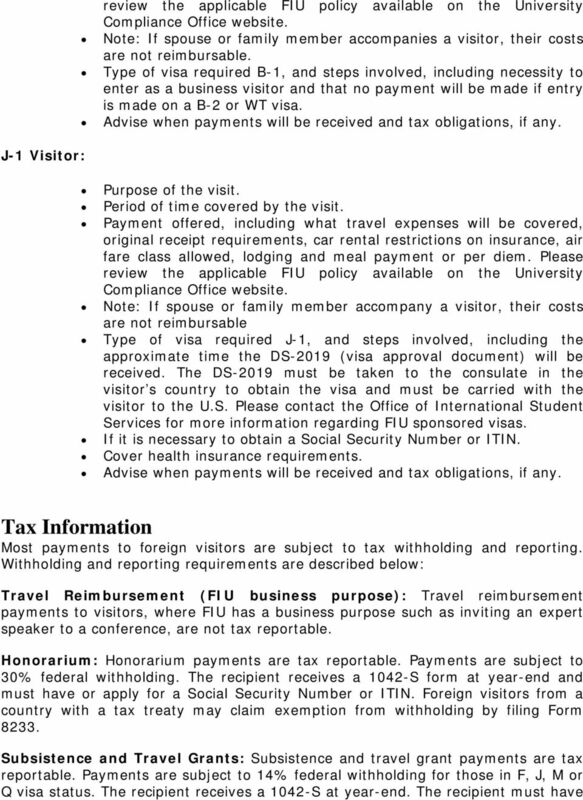 How to Get Help For questions regarding paying travel reimbursement or honoraria, or any other payments to foreign visitors, please contact Tax Compliance - Mairelys Perez (7-7561), Ciro Castro (7-6764) or Remember, the key is to plan ahead. I. Policy: All other University Finance policies and procedures apply in addition to those stated in this document.